Martin Liquori was born September 11, 1949, in Cedar Grove. He attended Essex Catholic High School. Marty's fame as a middle distance runner exploded in 1967 when he became the third American high school athlete to break the four-minute mile with a time of 3:59.8. After high school, Marty decided to enroll in Villanova University, where he was coached by the legendary Jumbo Elliott, who was known for producing 28 Olympic competitors in his lifetime—five of whom were gold medal winners. Marty qualified for the U.S. Olympic team in 1968 when he was only a 19-year-old freshman. He made it all the way to the finals, but he suffered a stress fracture, and could manage only a 12th place finish. Marty was still the youngest person ever to compete in the final. In 1969, Marty competed in the NCAA indoor mile, coming in second to Jim Ryun—the first high school runner to break the four-minute mile. At the same competition, Marty beat out Ryun to win the NCAA outdoor mile, and edged him again that same year for the AAU outdoor title. He won the AAU outdoor mile again in 1970. Marty's best year was 1971, in which he won the NCAA and AAU outdoor titles and received a gold medal in the 1,500 meters at the Pan-American Games. He also beat Ryun (and his own personal best time) in the Ryun-Liquori ìDream Mileî in Philadelphia, finishing in 3:54.6. Marty's career was slowed by an injury suffered near the end f the 1971 season. It kept him out of the Olympics in 1972. In 1975, he improved his time in the mile with a record time of 3:52.2. That same year, he set a U.S. record for the 2 mile with 8:17.12. He retired from running in 1980. 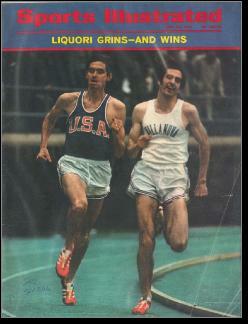 Marty was ranked #1 in the world in both 1969 and 1971 for the 1,500 meters and the mile. He was also ranked #1 in the world in 1977 for the 5,000 meters and set a U.S. record of 13:15.1, while finishing second to Ethiopian runner Miruts Yifter in the inaugural World Cup. Marty wrote "Guide to the Elite Runner," "Home Gym Workout," and an autobiography, On the Run, and is the founder of Athlete Attic Footwear. He serves as an NBC commentator at the Olympics and other track and triathlon events. In his early 40's, Marty was diagnosed with chronic lymphocytic leukemia (CLL). It has since gone into remission. He now plays jazz guitar professionally at a restaurant in his hometown of Gainesville, Florida.